After only a few short weeks, I’m back into end-game content, running through Heroics and dabbling a little in Highmaul. The road to get there is more challenging than it has ever been in the past, from what I can remember. Getting there was a good refresher on playing as a hunter, and it helped me in getting back on my feet after my long hiatus from WoW. Raiding has always been my favorite aspect of the game, and I really am glad to be getting back into that aspect so quickly. Now, if you are running with a premade group, a lot of this will not apply, but from a LFG perspective it will provide what you can expect to have to do before being able to run into heroics, and ultimately into the end-game raids that are currently available. First off, your primary objective should be getting to level 100 so you have your final abilities, level 100 talent, and everything available to you class-wise. It’s worthwhile to run dungeons and instances while leveling up, but know that the gear you get will quickly be replaced by quest gear or crafted gear. There is something to be said about knowing the boss fights before you hit 100 and start doing heroics, so you might consider searching for some instance guides or checking out some YouTube videos so that you can familiarize yourself with the fight mechanics. If you take a look at the LFG panel, you can see what the Gear Score requirement is for Heroics. With a modest 610 requirement, it feels like it’s in the right place, though 615 or 620 might have been better for pacing in the long run, and would have given folks more reason to run the non-heroic dungeons first. Keep in mind that your gear score is based on what you are wearing AND what you have in your inventory. While I don’t feel this makes a lot of sense, it allows you to do things to get around the requirement without actually being geared appropriately. As it stands, I was able to reach 608 personally by crafting my engineering Gun and Helm, and including what I had acquired via quests. 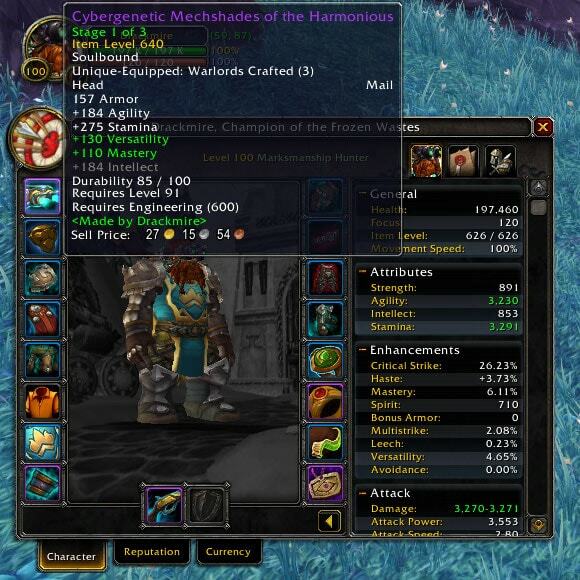 Finally, with the completion of the first part of the Legendary quest to get my iLVL 640 ring, I was able to push it over 610 and unlock the heroics. That being said, I did run normal Skyreach before hopping into heroics in order to finish the quest. So having finally reached the gear requirement, I went to hop into a heroic and get the fun started, only I still wasn’t able to queue for them. So I rechecked everything, and went back to the LFG panel and noticed that there were still locks on the Heroic dungeons. Much to my chagrin, there was yet another requirement to get into Heroics. I had to complete one of the silver proving grounds tests. 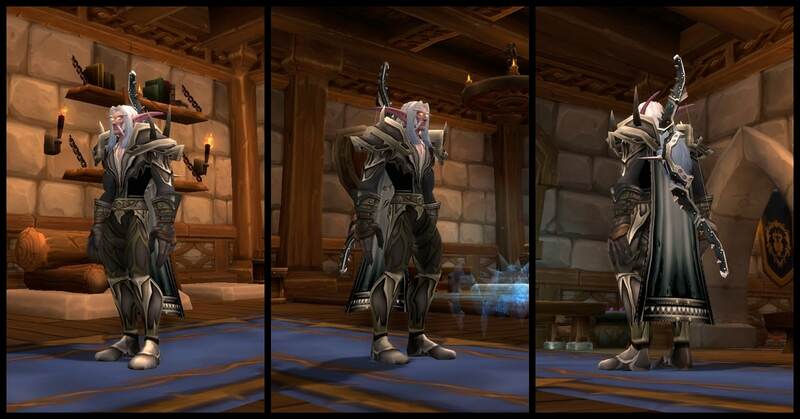 As a Hunter who started playing WoW since vanilla, back in November 2004, I have many fond memories of the game. I have made numerous online friends, who I still keep in touch with. 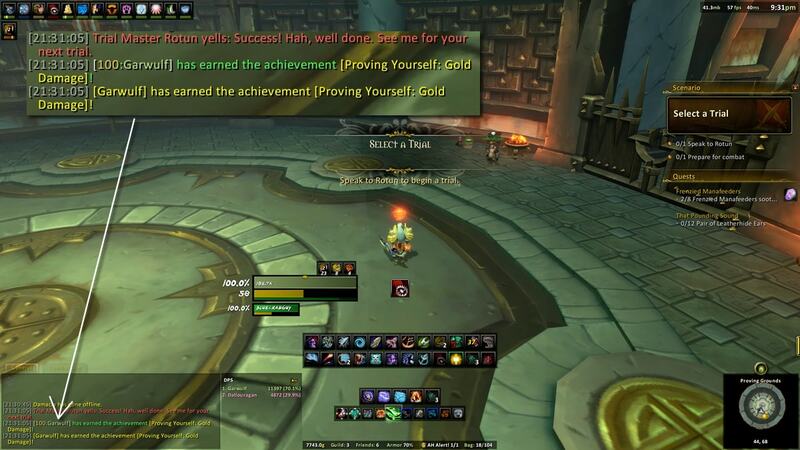 I have seen the game progress and get better, and worse, and better again, etc… Despite all the changes, nerfs, buffs, and other miscellaneous intricacies of WoW, I still get a deep sense of enjoyment when I play the game. That being said, I have not played WoW the entire 10 years it has been out. In fact, I just started playing again in Warlords of Draenor. I stopped playing shortly after the release of Cataclysm, and did not play at all during Mists of Pandaria. This was purely for personal reasons, and had nothing to do with the direction of the game. Real life just took its toll, and sometimes you have to put down your hobbies for awhile. However, through much peer pressure (looks at Garwulf), and finding a time in my life where I feel I can take on the time required to play it again, I decided to go ahead and upgrade my subscription (digital deluxe version of course) and dive right back in. Talk about a giant belly flop. The first thing I encountered was a free character boost for any character I had, to get them directly to level 90. I didn’t want to spend time in the Mists of Pandaria content right away, so I just put it on my hunter (who was already 85), though in hindsight I probably should have used it with another much lower character. Come on Blizzard, don’t you know I’ve been Marksman for like 90% of my WoW time (I’m fond of Marksman, in case you didn’t know…)?! Anyway, I selected Marksman and then logged in to the game. When I logged in, I was in front of the Dark Portal in the Blasted Lands with 2 abilities on my hot bar, and 3 items in my inventory; wait what?! 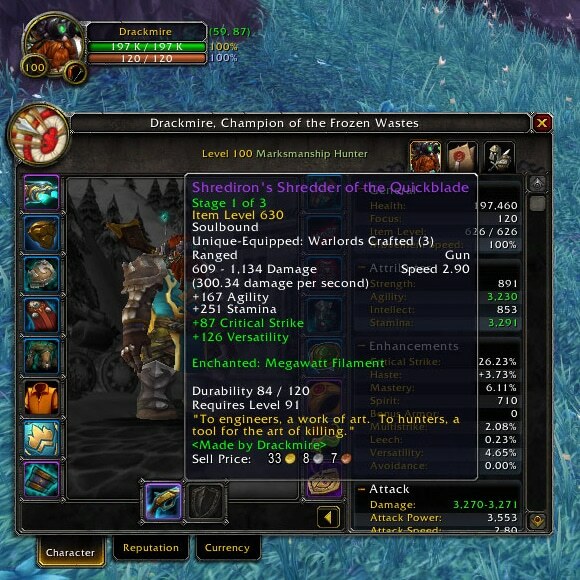 I had my Hearthstone, some food, and a random quest item from Northrend. I had all my gold, but wondered where my items had gone… Now, chances are nothing in my inventory was worth anything at this point, but I did have several engineering items I didn’t want to have to craft again. First things first, let’s find my abilities and get my hot bars loaded so I can start shooting stuff…except I don’t have any abilities!? Not one to be easily dismayed, I started opening all the panels I could – looking for abilities and found out that the specializations now only have 4 core abilities each. 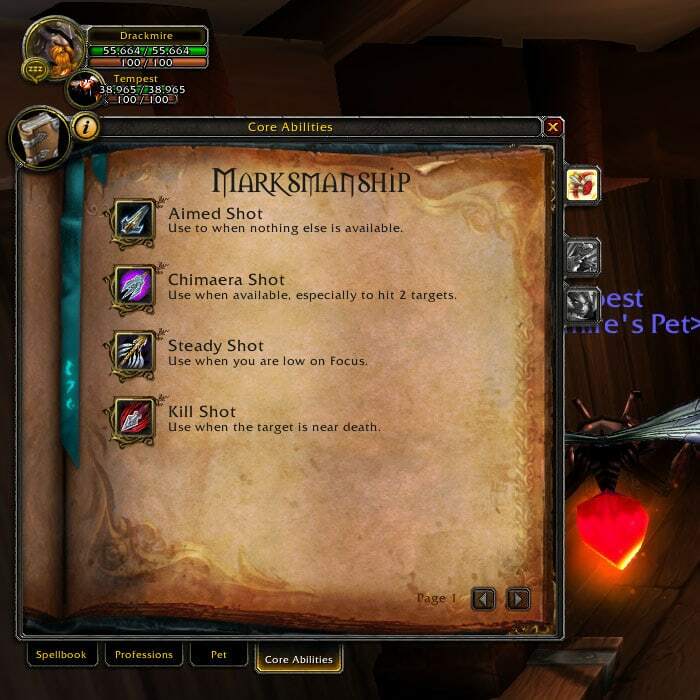 Marksman now has Aimed Shot, Chimaera Shot (which hits two targets now), Steady Shot, and Kill Shot. I tried dragging abilities from various panels and was not able to add anything to my panels except for pet abilities and my racial ability Stoneform. At this point I was kind of frustrated, so I went to use my Hearthstone, but it was attuned to the Dark Portal… :/ I hopped on a mount and rode along the ground to get to the nearest flight master. That’s right, you heard me, rode along the ground. Turns out you are grounded immediately after logging in from a boost. There’s no UI update or new posts around here because I can’t log off long enough to work on the site. Blizzard over-delivered with this expansion, IMHO. I’ll try to get the UI comp packaged and uploaded with the week, however. And if any of you haven’t seen this treasure mod yet, please give it a try. 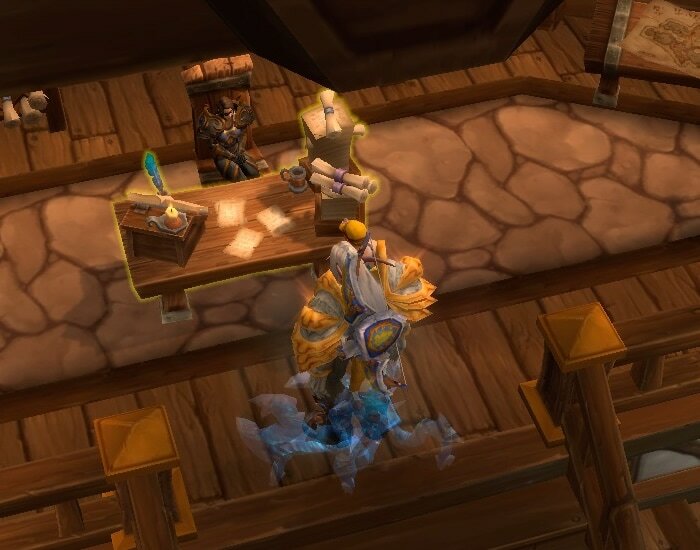 It kinda feels like cheating, but it’ll do the job if you’re having difficulty acquiring resources for your Garrison. You guys enjoying Warlords of Draenor?